While we were on Royal Caribbean's Liberty of the Seas a couple weeks ago we found ourselves saying over and over," this is different from our last cruise because [insert reason here]." There were lots of things that made this trip different including a different cruise line and ship, a different aged child and having a set of grandparents along with us (which made it more fun and offered so much help with a busy cruising toddler). Having a 15 month old vs an almost 10 month old on a cruise ship made for a very different experience. We got to do more around the boat since are in the stage of one nap a day instead of two and Perry was able to run and play and interact with his surroundings so much more. Watching him clap and dance and give high-fives to the crew was priceless and so fun. At the same time he has gotten more independent (and opinionated) and we spent more time chasing him around this cruise than last time (since he wasn't even walking then). We quickly found the good places where he could run and expend energy. He had no noticeable motion sickness (our family really just doesn't have much trouble with that) and is so adaptable to new beds and surroundings. 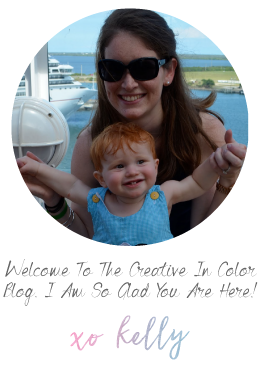 It was a great time and I still say that cruising is an awesome way to travel with babies and toddlers. Here are just a few observations of differences between our Disney Cruise Line (DCL) experience last October and our Royal Caribbean (RCCL) experience a couple weeks ago. There were some things we liked better about both cruise lines and at the end of the day would happily cruise with either again. 1. The rooms. 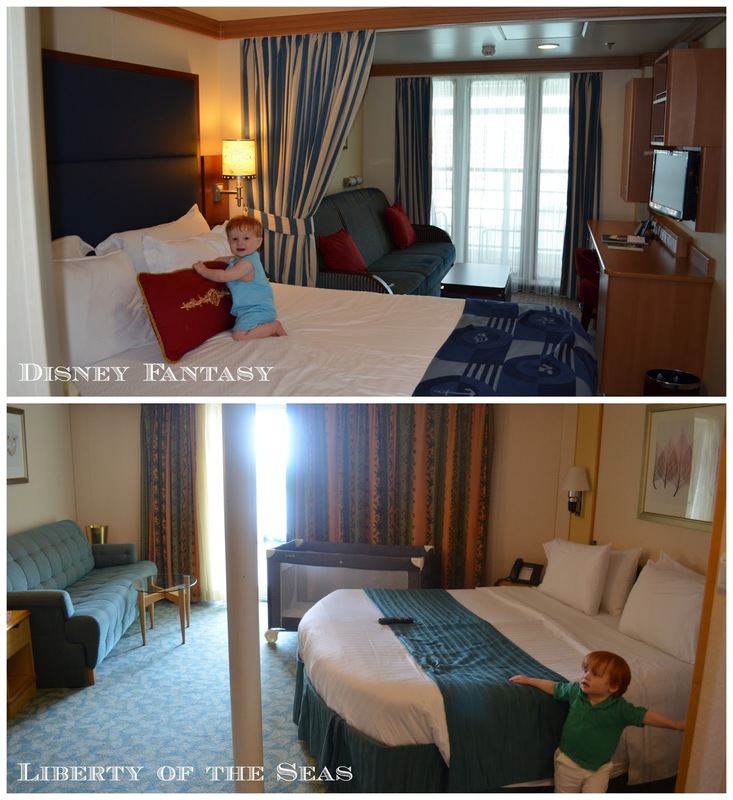 We lucked out (with the help of a lot of online research) to find a fabulous room on the Liberty of the Seas. If you cruise RCCL, spend some time with cruisecritic.com when selecting your room. Because we were in a corner our room and balcony was enormous and we paid the same as a standard balcony room. I think these big corner rooms on the Disney ship's we are accessible rooms (which makes sense...you could have rolled a wheelchair in there it was so big). One thing we liked better about DCL was the actual bathtub instead of the shower (although the shower was not as big of a problem as we expected since it had a detachable head and you could essentially just soap the baby up and spray him off). Another pro for us in the Disney category was the curtain they had in the middle of the room that could create a divider between the bed area and the sitting area. This allowed us to have lights/TV/etc on in the room while P was asleep in his pack and play without disturbing him. I would highly advocate for a balcony room if you have a little one so you can enjoy that during naptime and early bedtime. I wouldn't do the balcony though otherwise because you are in your room so little. 2. Dining. 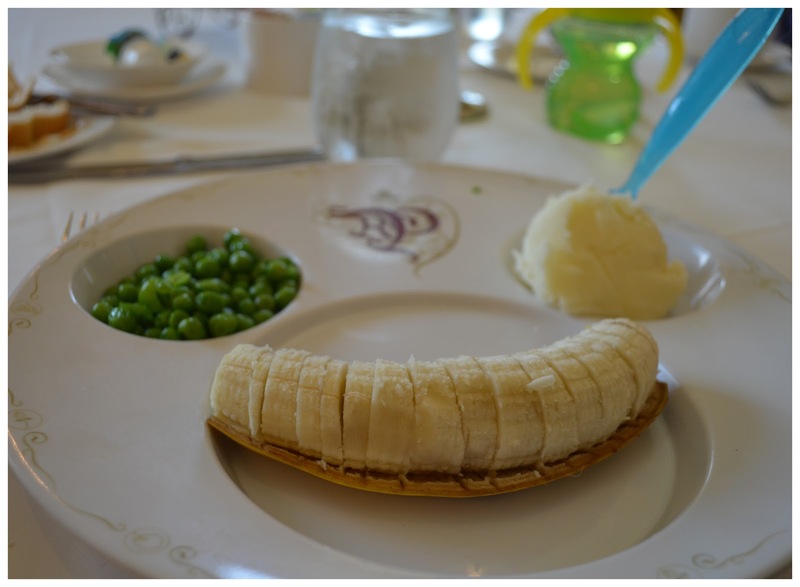 We are not foodies or have terribly refined palates but we enjoyed the food probably equally on both cruise lines. Both were equally accommodating to having a little one and went well above and beyond in making sure P had good food to eat. From pureeing fruit and veggie concoctions for a 10 month old to cutting up chicken tenders and providing a continual supply of strawberries and bread to a 15 month old, both cruise lines were fantastic. Disney offers free soda at one location on the pool deck. With Royal Caribbean if you want soda you had better buy the Coke package. Andrew and I ate at a specialty restaurant on both cruises: Chops Grill on the Liberty of the Seas and Palo on the Disney Fantasy. We had amazing experiences at both places, but Palo still stands out as one of the best meals I think I have ever had (both for brunch and dinner). We love having a consistent set of waiters and table mates each night at dinner and that was true both times. Disney has an interesting way of doing dining where there are three restaurants and you rotate through them, but the people you sit with, the time you eat and your servers remains the same. I think across the cruise industry there is a push towards more freestyle dining and we will probably be forced to do that eventually...but I personally really like the predictability of traditional dining. And the fact that our drinks and a plate of fruit for Perry were there waiting on us each evening before we even got to our table. 3. Fellow cruisers. Of course it goes without saying that there were more children on DCL compared to RCCL, although there were plenty there as well. Both cruise lines brag about their family friendliness and it is true. Regardless I think there will always be more kids on Disney. 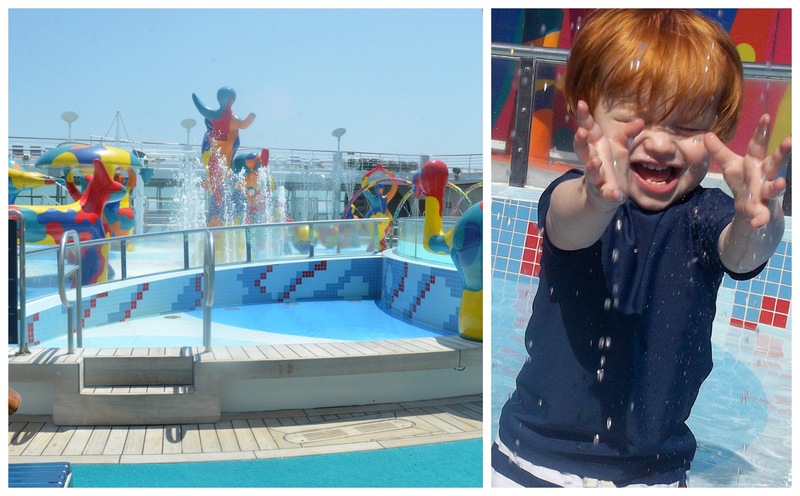 There are other cruise lines that I think would be less ideal and accommodating to small kids but both of these are great and in general your fellow passengers are kid-friendly as well (and are not going to give you looks that say "why do you bring your child"). 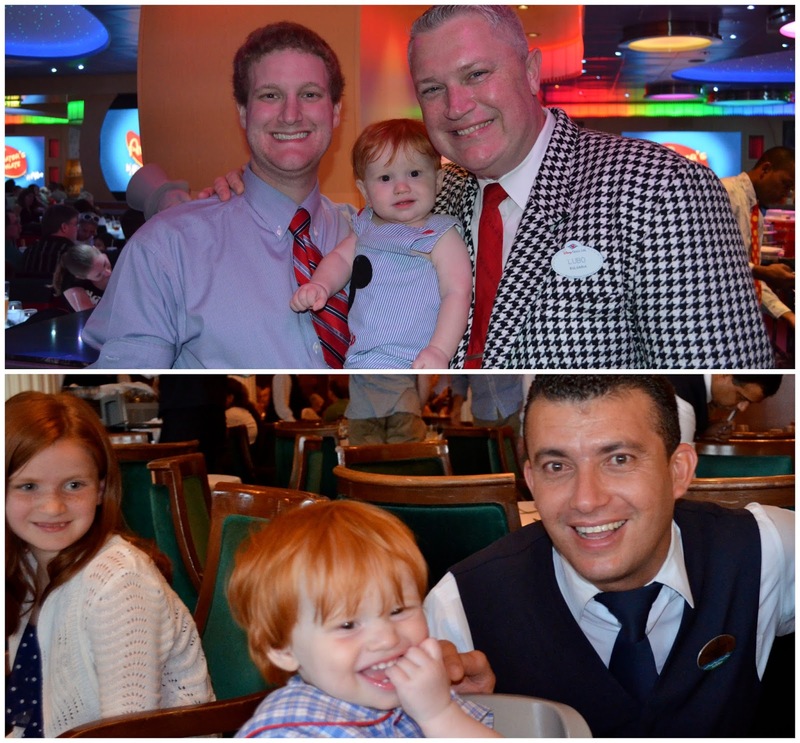 Perry made lots of new friends from our fellow passengers (young and old) on both cruises. 4. Characters! 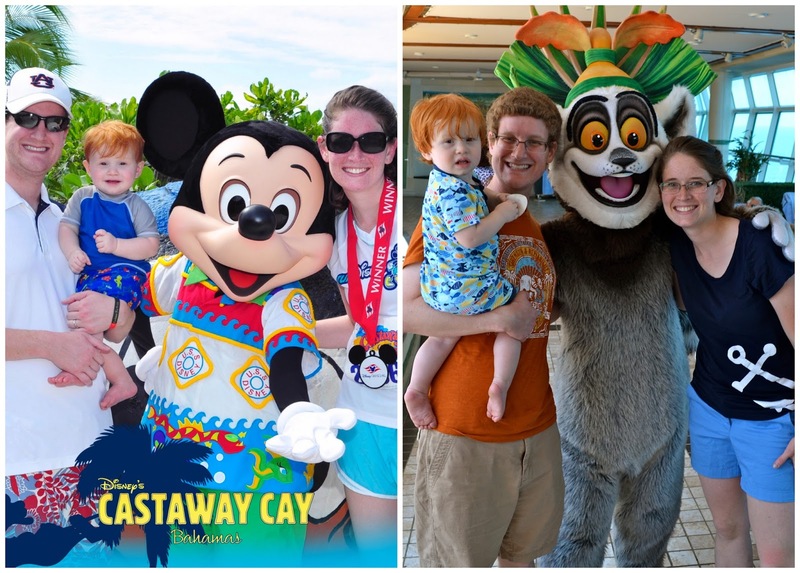 Besides the obvious differences in this category being that Disney Cruise Line lets you meet Disney characters and the newer Royal Caribbean ships let you meet DreamWorks characters, there are some other differences between the two in the area of character interactions. There are simply more character opportunities and more diverse sets of characters with Disney. 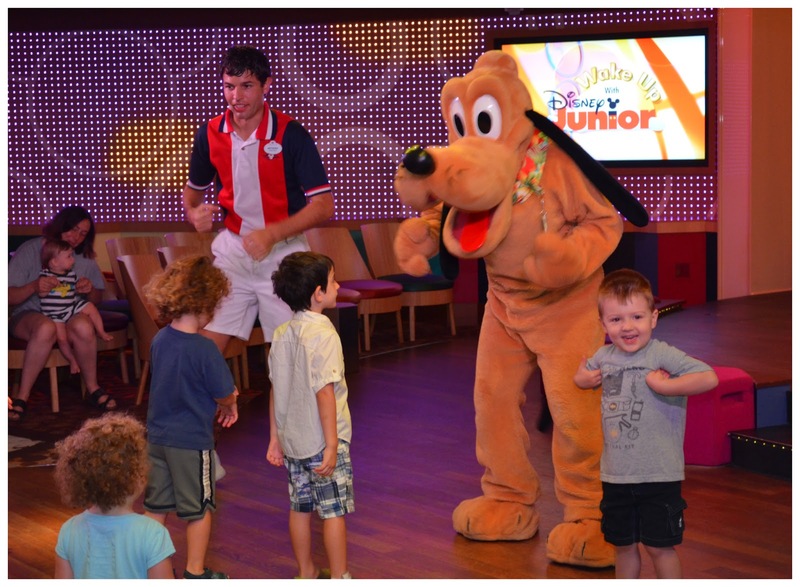 However, the character meet opportunities were far easier and faster on Royal Caribbean. There was hardly ever a line. You did have to be careful because if there was a ship photographer standing there taking photos they were very strict about not letting you take photos on your own camera (unlike Disney were at any time they are happy to use your camera as well as theirs). Sometimes the character meets were BYOC (bring your own camera) which is what we learned to go to...because we are not into paying for professional cruise photos. RCCL had a DreamWorks character breakfast that we went to. I think it was a nice attempt at competing with a Disney-like character meal however having done Disney character meals many times this was just not as well done. They brought the characters out one at a time to go around the room meeting people and taking pictures and an hour into the meal, Perry was over it and so we left without even seeing who the third character would be. The bigger Disney ships like we were on do not do character meals (like the smaller Disney ships do) so I can't speak to that experience...but the Disney character meals in the Disney parks were more enjoyable and well done than the DreamWorks meal. I have a bias towards Disney characters over DreamWorks characters (and we found ourselves missing things like "Wake up with Disney Junior" on the Disney Fantasy, the early morning toddler dance party with Mickey and friends) but it was cool to have some characters at all outside of Disney. 5. Diapers and Pools. There is a pretty strict rule across all cruise lines that children in diapers are not allowed in pools for sanitary reasons. That is something to be aware of if you are taking little ones on a cruise. Some cruise lines have started putting separate baby pools or splash areas on their newer boats (or boats that have been through recent refurbishments) for kids in diapers. These pools have separate filters and sanitation methods that make it ok. Both boats we have been on have had such an area (and was a large part of our boat decision making...I think it would be sad to go on a boat where P couldn't swim). In this category Disney wins, hands down. 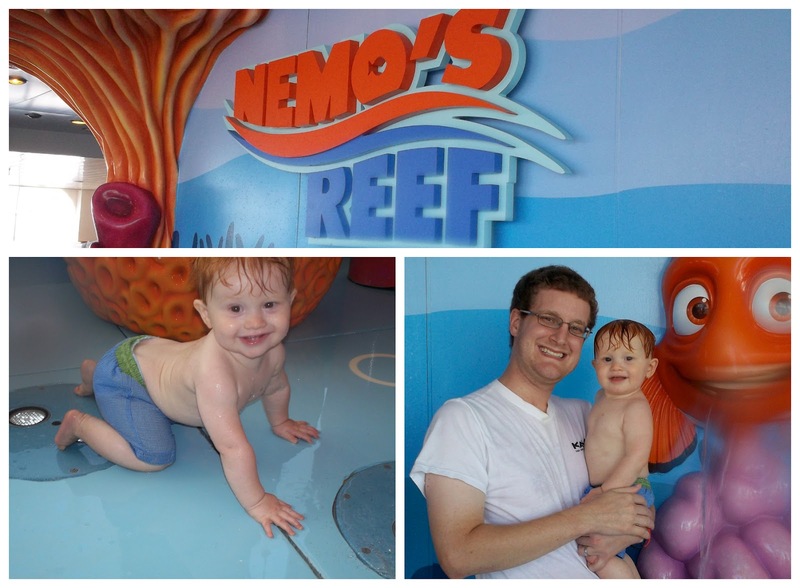 Nemo's reef on the Disney Fantasy (top photos) was awesome. It was a couple inches of water with lots of fountains/slides and water splash elements and best of all it was covered so no need for sunscreen! The baby pool area on the Liberty of the Seas (bottom photos) was out in the sun, small with one tiny fountain-like thing, and was right next to the big kid splash area which only made the babies want to go play there. Perry still liked it and had a good time playing in the baby pool (with a good layer of sunscreen on) but Disney's was way better. 6. Nursery. I cannot speak much on the Royal Babies and Tots nursery on the Liberty of the Seas. Because we had grandparents with us this time there was no need for paid childcare. Our only experience with them was checking out a bag of toys for P to play with in our room. The facilities looked nice and the staff was sweet and friendly though. We had some communication miscues with the It's a Small World nursery on the Disney Fantasy last October that resulted in them not quite doing what we asked (like giving him a bottle and changing him into pajamas). I am sure the nursery is generally a safe and loving place for kids to be on any ship that offers one. Although the fact that nursery will let you leave your child there while you get off the boat and do shore excursions totally freaks me out and I would never ever do that. One thing worth noting here is that on Disney ships you have access to these devices called Wave Phones. You have two of them in your room and your family can use them to text/call one another while at sea. This also provides a way for the nursery staff to communicate with you while they have your child (I could text them and ask if P was still napping or not). I would have missed that link if we had used the nursery this trip. 7. Activities. Disney has no casino, there is one obvious difference. The Disney Fantasy had the AquaDuck, a really fun "water coaster," while the Liberty of the Seas had an ice skating rink and surfing. There were more organized activities for the very little ones with Disney, but RCCL did have toys and a play mat set out all day every day in a lounge for babies to play with their parents. All in all most of the daily activities are pretty standard regardless of cruise line, the Disney ships just have a little Disney spin put on everything. We really liked the puppet show for toddlers on the Liberty of the Seas and the added entertainment of having an ice skating show to go to. You will not find yourself bored on any large cruise ship, and if you do you ought to just go find a lounge chair by a window and rest a while. All in all I think the experiences were largely similar and overwhelmingly positive. We would and probably will cruise both cruise lines again in the future and make decisions based on things like time of year, itinerary and cost. Disney prices can be much higher than other cruise lines and I don't think I could ever justify it during peak travel seasons like summer break. However, if I was forced to choose and cost was taken out of the equation, I think DCL would get my vote.